concepts in perceptual psychology, which suggest that we experience the visual world (and representations of it) as three layers of space: usually labelled as ‘personal’, ‘action’ and ‘vista’ space. 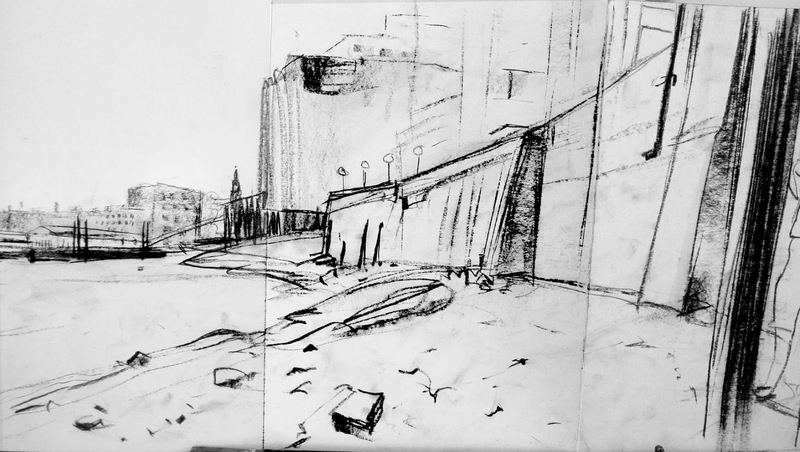 This workshop sets out to explore how we might exploit this concept when drawing on location. Just so we’re clear: ‘Personal space’ is the band of space nearest to the viewer, extending perhaps 2 metres at most. ‘Action space’ extends perhaps 20-30m further – representing the furthest distance that the viewer could interact with by shouting, or throwing, perhaps. ‘Vista’ space is all the rest – everything that falls beyond the viewer’s sphere of influence. Research evidence suggests that this perceptual framework of three broad bands is universal to humans, and that particular sets of perceptual cues relate to the different bands. The reason for this may be that the closer to the individual, the greater the level of potential threat or influence increases. The three bands do not have sharp boundaries, rather they merge one into another, but they are clearly distinct. We experience the world as having these distinct bands. When we walk a city street we are intensely aware of things that are close to us or might be approaching, usually less aware of things in the distance. However, when we draw in a city street, we often choose a viewpoint and scope that doesn’t include personal space, or even vista; or we choose to ignore what impinges on our personal space in the marks we make. Sometimes the inclusion of personal space, or vista, in a street scene, can be a means of increasing the viewer’s emotional engagement with the scene depicted. 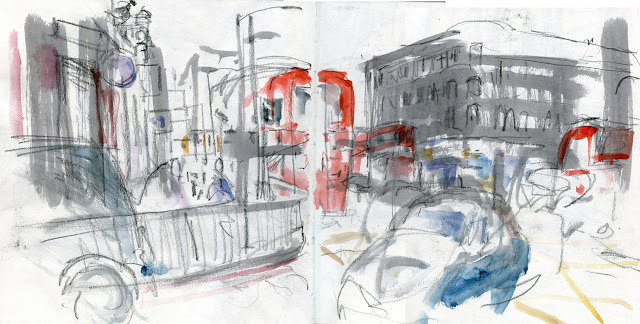 How can we capture something of our full experience of urban space in our drawing? There doesn’t seem to be an easy answer! Depicting different depth bands in a picture raises interesting challenges of scale, size and detail for the artist. 1. A brief explanation of the concepts, with some illustrations and a chance to discuss them and their implications, including depth cues. 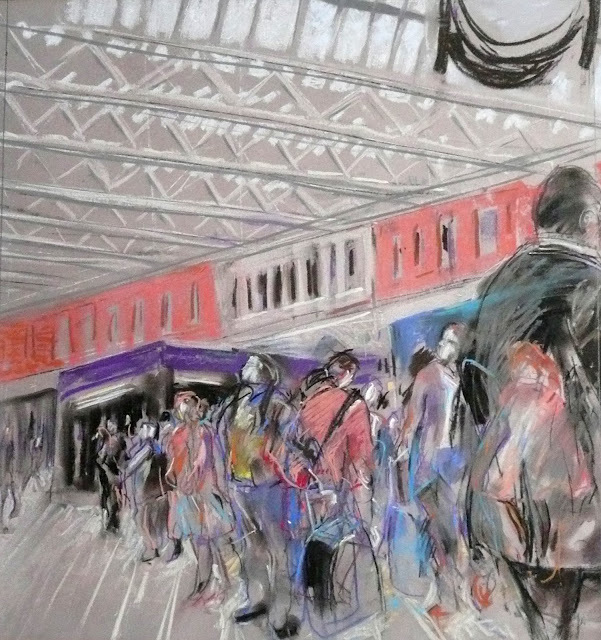 What is the effect of including personal space in your urban drawing? What problems do you encounter in doing so? Is it possible to make urban drawings that focus solely, or mostly on personal space? Could you make urban drawings that focus on vista alone, with no intervening action space? What are the challenges in making urban drawings that depict all three depth bands, and what are the ways that you might rise to these challenges? What effect does the shape of your paper, the materials you draw with, have? The aim is not to promote a particular approach to drawing, but rather to make conscious stuff which is often non-conscious.